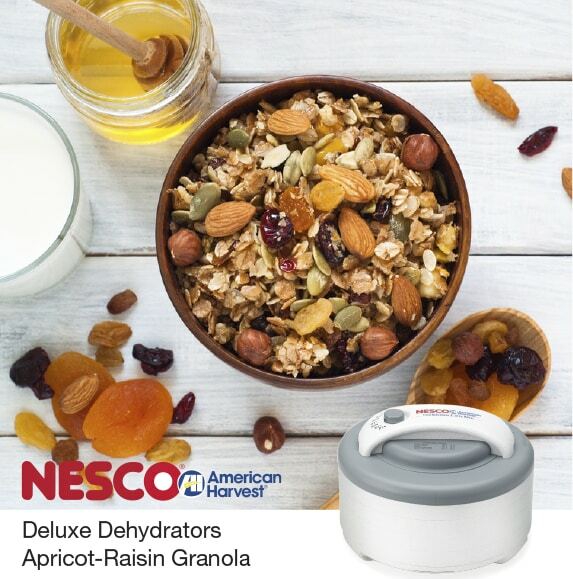 Make you own fresh and wholesome granola at home with a Food Dehydrator from NESCO/American Harvest. This recipe for Apricot-Raisin Granola is one you’ll want to make again and again. A tasty way to start your day, or as a snack at home or away. Pour 4 cups oatmeal or rolled oats into bowl. Add oil and brown sugar (more sugar for sweeter bars). Toss gently until blended. Add sunflower seeds and almonds. Mix well. Sprinkle onto Solid Fruit Roll Sheets 1/2 inches thick. Place in your Nesco®/American Harvest® Dehydrator on dehydrator trays. Dry 4 to 7 hours at 145° F until crunchy. Toss with apricots and raisins. Store in air-tight container.